A great mudroom design adds functionality and elegance to any home. Whether your mudroom is the main entrance to your home or a backroom where the kids and dogs go in and out, you want it to be functional, organized and beautiful. From inspiring mudroom design to functional layouts, these spaces get top billing in my book. See why each is unique and how you can incorporate these ideas into your own mudroom. Take advantage of ceiling height by taking storage all the way up. Too high to get items down? Start by storing lesser-used items up high, then add a rolling library ladder to get you to the top. It looks great while being functional. Durable slate tile is rugged enough to stand up to heavy use and provides a beautiful contrast to the traditional-style woodwork. Make the most of your space by creating a combo mudroom and laundry room. The sink is great for cleaning up when the kids come romping through with muddy or snowy gear. And with the laundry nearby, you can toss the outdoor clothes in the wash as soon as they strip it off. Working with a designer to create a beautiful and functional mudroom ensures you get exactly what you want to meet your family’s needs. Ask to see 3-D drawing like these so you can easily envision what the end product will look like. This mudroom design by Beautiful Habitat is currently under construction. I can’t wait to share it with you when its complete! When your mudroom also happens to be the front entry to your home, it has to look inviting and organized — who wants to talk into a messy pile of shoes? Here, each family member has ample locker space with hooks for coats and hats, a drawer for small items and divided floor space to keep shoes neat and tidy. A side or back entry with a dedicated mudroom space can be hidden from the rest of the home in fun and interesting ways. Even if it looks as nice as this, sometimes you just want it out of sight. 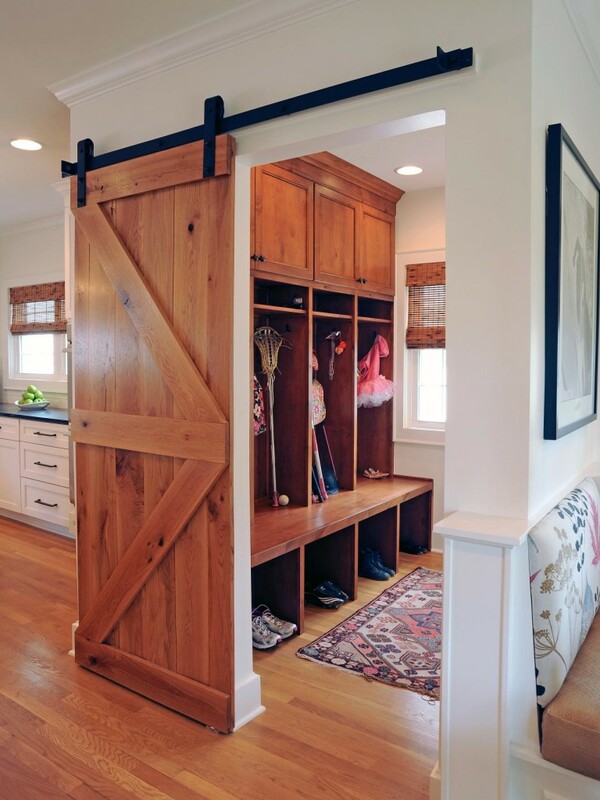 This mudroom stays under cover with a rustic sliding barn door. Here in Colorado, we love our pups, but we don’t always love the mess they can make in the house. Incorporating doggy space into the mudroom offers a great way to tackle mess and keep feeding and other supplied under wraps. An indoor dog wash is extra handy and can be designed to complement any home style. This mudroom with enclosed storage includes chalkboard doors so the kids can decorate the space over and over again. The enclosed shoe storage is ventilated with holes to keep things smelling fresh and allow shoes or wet boots to dry out even when they are put away. Create a more modern space using a bold color — black. While it might seem an unlikely interior color, it looks sharp and grounds the space. Repeat elements in the space such as squares in the storage unit and shelves on the wall. Or create nice contrast and warm the area with a chunky rustic bench. Create an organized catch-all space in your home that looks so amazing you’ll want to show it off! Beautiful Habitat can help. Contact us today.